DSC_0018.JPG, originally uploaded by michael_jecks. 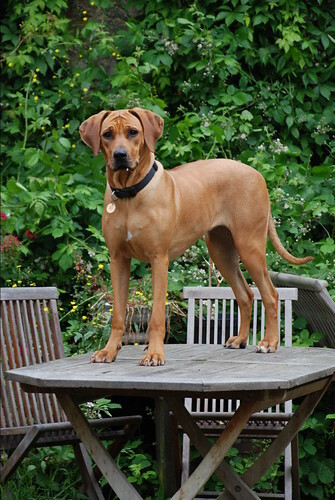 Rhodesian Ridgebacks are known for their intelligence, determination (usually to steal any food you might have about you) and usually their laziness. They are more or less the architypical hound. But this one’s still very young, and there is nothing she won’t do to get herself a better view of the world. Such as jumping onto the table in the garden, or in the kitchen. Or in the hall. Or leaping onto my lap while typing (four times this morning). Or hopping up onto the window seat to watch the world go by. Thank goodness she’s got a wonderful personality and temperament. A dog that size wouldn’t be funny if she had an ounce of nastiness in her nature. « The Same Weir near the Mill Bridge, Exeter. This entry was posted on Tuesday, June 26th, 2007 at 8:13 pm	and is filed under Dartmoor. You can follow any responses to this entry through the RSS 2.0 feed. Both comments and pings are currently closed.